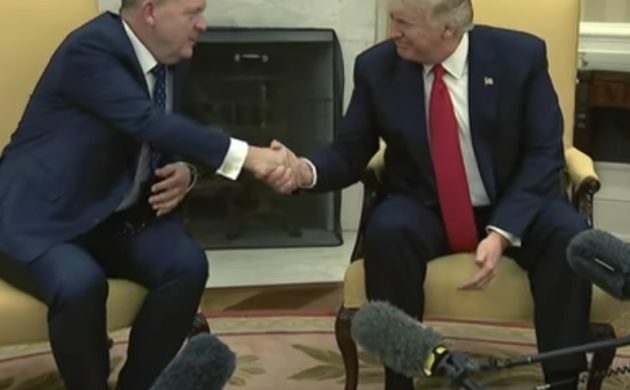 There were no awkward silences, ignored handshakes or cold body language at the press conference following the meeting between PM Lars Løkke Rasmussen and US President Donald Trump yesterday. In fact, it looked quite the opposite of Trump’s cringeworthy meeting with German Chancellor Angela Merkel recently. Rasmussen and Trump looked to be getting on like a house on fire. Both men were all smiles and throwing about the plaudits for one another during the press meeting, and their handshake for the cameras included a loud clap as their hands clasped together in a manner befitting a family BBQ rather than dignitaries at a White House. And a family affair it sort of was (see the handshake in the video below). “We talked a little about our families and about Russia, as I have met Vladimir Putin before,” Rasmussen told DR Nyheder. Rasmussen said that Trump was a very affable person to be around and he experienced the president as being interested and open to proposals. Following a meeting that lasted about an hour, the pair emerged to tell the press that they discussed matters such as the EU, the green transition, NATO and fighting Islamic State (IS). Trump revealed he was “very close” to finding a new ambassador to Denmark. He also said that Denmark was a very good ally. “This administration should be judged by its actions, and not single tweets, because it’s tough to get all the nuance out in 140 characters,” said Rasmussen.